Salem, OR—Today, Oregon's Kid Governor Dom Peters was inaugurated in the Oregon State Capitol's Senate Chamber. Many attended the inauguration ceremony, including Dom's family and classmates, the seven other finalists for Oregon's Kid Governor and their families, and a number of Oregon senators and state representatives. Secretary of State Dennis Richardson, Senate President Peter Courtney, and Former Chief Justice Paul De Muniz all spoke during the ceremony, giving short civics lessons on their respective branches of government. 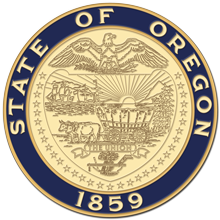 “We are thrilled to be the second state to teach civics in a new and exciting way through the nationally award-winning Kid Governor program,” said Mary Beth Herkert, Oregon State Archivist and Director of Oregon's Kid Governor program. Oregon's Kid Governor is a statewide civics program first implemented in Connecticut and adopted by Secretary of State Dennis Richardson to engage 5th graders in learning about their government through hands-on experience. Over 20 students submitted videos with their plans for tackling an issue they felt passionate about, and eight finalists qualified for the official Kid Governor election. More than 1,300 5th graders across the state voted in the election, and Dom Peters was chosen to be Oregon's first Kid Governor for 2018. Dom ran on an anti-bullying platform. Watch the complete inauguration video on Oregon's Kid Governor Facebook page as well as follow Dom's work as Kid Governor on Oregon's Kid Governor official website and blog. Dom will be engaging in activities throughout the year to bring awareness to his platform and encourage kids and adults to participate in their government.